This week I am privileged to have on the podcast one of the men who’s heavily influenced my ministry here in Peru. I’m talking about Mike Breen, author and phrase coiner. In the first part of our chat, beginning around the 6:10 mark, I ask Mike where he came up with the idea for Lifeshapes. Many of us learn from reflecting on what has happened to us, and apparently we remember things and our brain sort of “maps out” what we’re learning into shapes. The fruit of how people think and learn things was a motivating factor in how Mike came up with the shapes, along with the help of people in his discipling community. He compares the Lifeshapes to how Jesus got his disciples and listeners to reflect on things using parables which were and ideas and mental images the listener could relate to and understand. Mike shares with us that while in Brixton, England he ministered to people in the inner city and encountered people who were “post-literate”, they may have known how to read, but didn’t do much of it. These shapes helped such people learn how to remember things in the Bible when they may not have been reading it much for themselves. 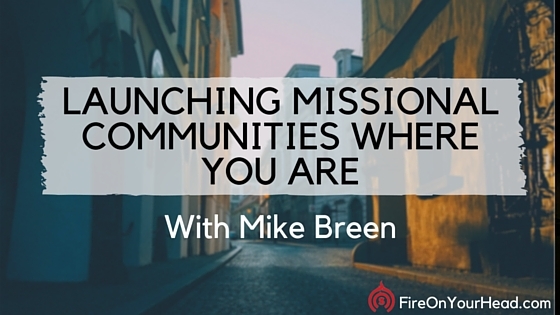 In the second half of the conversation (around the 26:13 mark) I ask Mike where Missional Communities came from. Mike shares some stories of how this took shape in the late 1980s and early 90s and what obvious lessons emerged from his experiences. Towards the end of this week’s episode he tells us of the “Happy hour” ministry he’s launched in his new neighborhood. Like his Facebook page at mikebreen3dm. Click on the images below to be taken to their individual pages. If you’d like to subscribe to the Fire On Your Head Podcast, visit our directory in iTunes, Stitcher Radio, or visit FireOnYourHead.com for more subscription options. ←Are You Drinking Undrinkable Water?